Vertical bars are fully adjustable, moving independently of enclosure rails to route cable up and down where needed. 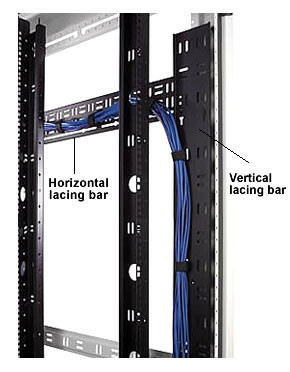 Combined with horizontal bars, the lacing bar kit creates a quick cable management solution. Great Lakes' model VLB-78 is a 62"H x 4"W Vertical Lacing Bar designed for the 78"H enclosure.